14th Apr 2014, 6:14 PM in Extras! Alright, apologies for the scrappy scan, first of all. I was really excited to upload this puppy, but in order to get a proper scan I really need to take it down to the UPS store- this paper is 10" x 17", ugh T.T A better one will be up soon! 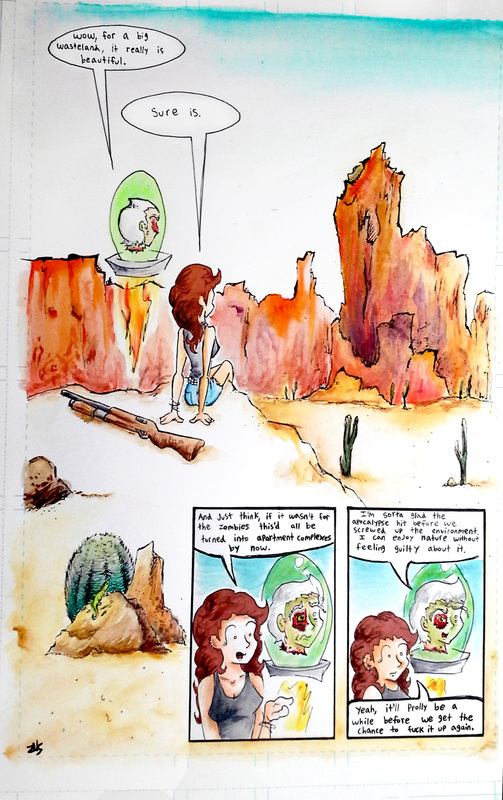 This page came from the realization that a) I have nothing to exhibit in the event that I have an Earth Day booth at Mesa Community and b) I don't have many Hired Guns "prints" for sale. I like my watercolors and canyons though, so I sat down and did this over a Dos Equis.